Hope Wing woke up at 3 a.m. Monday and saw a red glow to the south from her home in Potter Valley. She and her husband, Rick Abbott, drove to the McHugh trailhead. They watched huge flames leap above the rocky cliffs. A wildfire that started two days earlier in McHugh Valley had exploded overnight. "I tasted fear," Wing said. "Tasted it." 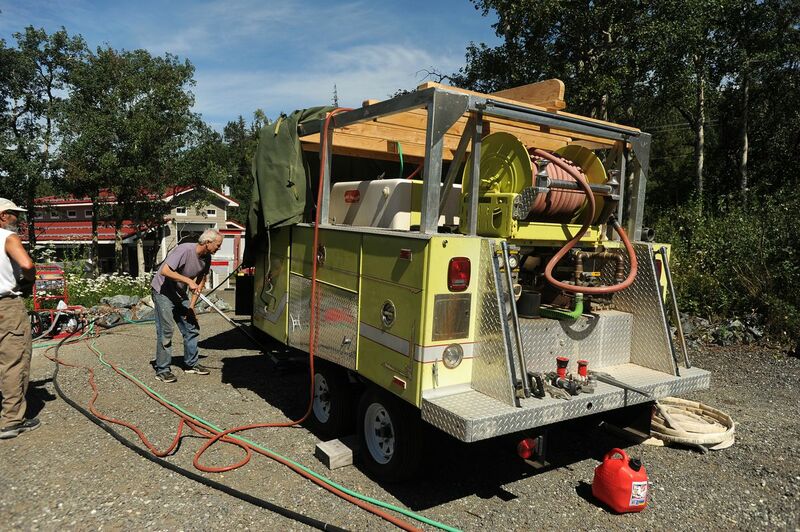 On Wednesday, Wing stood in front of her home off Potter Valley Road, next to what appeared to be a firetruck hooked up to a series of hoses. It was a brush firetruck, bought on eBay a few years ago, ready to fight exactly what they feared was coming. For three days, on this road about a mile from the north edge of the fire, Wing, Abbott and a tight-knit group of neighbors have been making preparations and pulling together. Some have lived in their homes for decades. But concern about a wildfire never seemed quite like this. Down the road from Wing, chainsaws whirred outside Janis Fleischman and Jerry Lewanski's home. The couple owns Fire Island Bakery. Fleischman built the house nearly four decades ago. In the living room, Fleischman was packing up belongings. "I've been in this house 35 years or so. This is the first time I've ever worried about it or packed up," Fleischman said, holding a trash bag in her hand. "The weather's really different. It's really dry. It's extremely dangerous." On Monday, Fleischman and her daughter, Rachel Saul, put out a call on social media. Friends poured in to help cut back brush, set up fire breaks and clear trees. 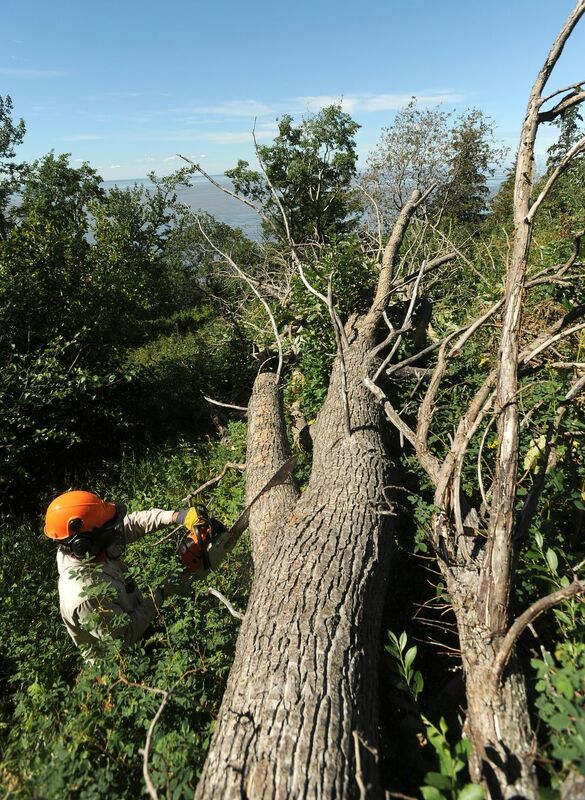 Fleischman guessed that about 60 trees around the house were cut down over two days. Their well, 300 feet deep on fractured bedrock, had run dry, an issue also faced by other neighbors. Fleischman said she and Lewanski installed four new water tanks and also have flame retardant foam, a newer way to help fireproof a house. But, she said, "we're facing a fire with no water." Chantal de Alcuaz and Josie Beavers rent a smaller unit attached to Fleischman and Lewanski's home. On Wednesday, they bought homeowner's insurance. They were hoping disaster wouldn't strike sooner than later. The insurance kicks in on Thursday. De Alcuaz is a carpenter and Beavers is a nurse at Providence Alaska Medical Center. Both stayed home from work Wednesday to help their landlords cut back brush. Lewanski ran the state parks division during the administration of Gov. Frank Murkowski. He said he and Fleischman had done bits and pieces of fire-wise stuff in recent years, but not nearly as much as in the past three days. "Nothing like an emergency to egg us on," Lewanski said, who was repairing a chainsaw on a table. Above the house, David Hamre, an avalanche specialist with the Alaska Railroad who lives next door, was driving an excavator and clearing brush along the dirt driveway leading to both homes. He borrowed it from Abbott, who rented the excavator earlier in the week. On his property, Abbott also welded together a makeshift system of hoses. The hoses were connected on Wednesday to sprinklers wrapping around the house and to the brush firetruck. Abbott bought the firetruck on eBay for $7,000 about five years ago from a volunteer fire department in a tiny town in Delaware. The side reads: "Magnolia Volunteer Fire Company." Abbott uses it for plowing in the winter, but it could also defend against a blaze. 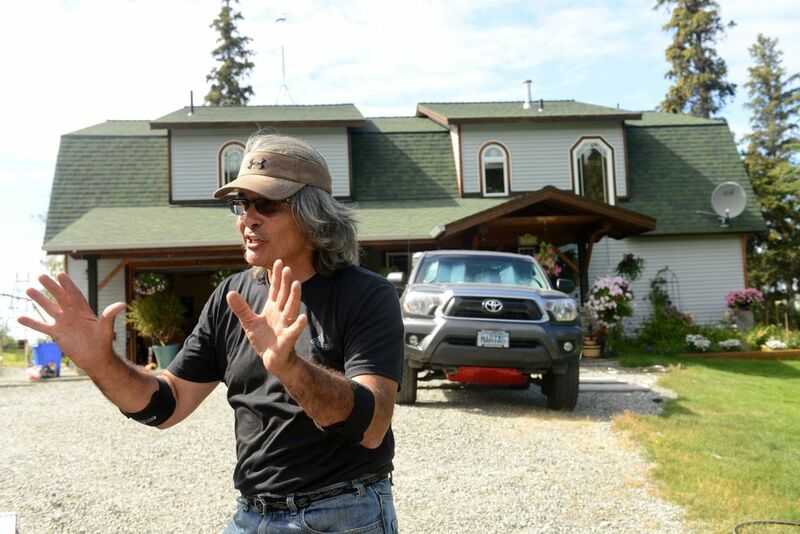 "Once he saw that, it was like, 'Bingo,' " Wing said, standing in front of the house. "That's what we need." A 5,000 gallon water tank sits beneath the tall work shed. Like Fleischman, Wing said they aren't relying on their well system. Their cars are packed. Wing rolled up the rug she carried out of Nepal in a backpack in 1979 and gathered her mother's china and crystal. She took her favorite utensil from the kitchen: An Ikea garlic press. Further down Potter Valley Road, Mike Dunn, a retired fire captain, was getting ready to attach his hose to a sprinkler on top of ladders next to his house, the side the fire would hit. He was also preparing to put a sprinkler on the roof. His wife was at Lowe's fashioning a spray system for the paste-like fire retardant. Dunn said he and Abbott, his neighbor, came up with that idea a few years ago. "For this day right here," Dunn said. He'd packed up the valuables in his house and moved his two boats elsewhere. But Dunn has relied on his neighbors over the years. He said he wanted to spend as much time as possible helping out and clearing brush. "If you took everything, you wouldn't have time to be with neighbors," Dunn said. Everyone hoped the rain would come. They hoped the wind wouldn't change directions. They all agreed that it was a miracle the wind was blowing west instead of east. Correction: An earlier version of this story misstated Jerry Lewanski’s position in the Murkowski administration. He was director of the state parks division, not the state forestry division.